I'm now officially on a quest to make a new bread pudding every time the stash of bread heels nobody wants to eat piles up. So far, I've done Rhubarb Bread Pudding, Cinnamon Roll Bread Pudding, and Lemon Bread Pudding. 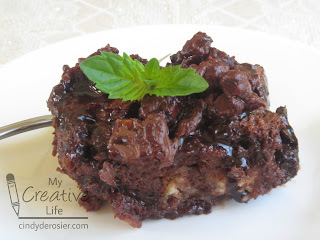 The latest is Chocolate Mint Bread Pudding. Use a piece of wax paper to spread the butter on the bottom and sizes of a 13" x 9" pan. Put the bread cubes into the pan. In a small bowl, whisk the milk, sugar and cocoa together until completely combined. Whisk in 4 eggs. When the mixture is smooth, add the mint extract. Pour the liquid evenly over the bread. Let it sit for 15 minutes so the bread can absorb the chocolate mint mixture. Preheat the oven to 325°. Gently press down on the bread to ensure that all the chocolate is absorbed and bake for 45 minutes. Remove from the oven and sprinkle evenly with chocolate chips. Let stand for 10-15 minutes before serving. You had me at Chocolate Mint, LOL!